The notion that one should learn in preparation for the holiday doesn't mean that a talmid chacham should stop his regular learning in order to learn halacha of the upcoming holiday, rather it means that a question about hilchot shavuot is given precedence to questions not about shavuot. Some, however, dispute this point. Some have the custom to decorate the shul for Shavuot with flowers, trees or nice smelling fruits. While some communities abstain from this custom because it may be considered a chok akum, others justify the practice. Similarly, some have the practice to hand out scented herbs so that people can smell them and recite a beracha. This should not not be done between Baruch Sheamar and the Shemoneh Esreh.Some also place flowers on the Sefer Torah itself or distribute flowers to be thrown at the Sefer Torah in honor of Shavuot. If Shavuot falls out on a Sunday, one should not place the greenery on Shabbat in preparation for Shavuot but should do so either on Yom Tov or before Shabbat. The Ashkenazic minhag is to read Megillat Rut on Shavuos. One shouldn't say Kiddush on Shavuot night until Tzet HaKochavim.Some say one should even wait to say Arvit, while others argue. If one didn’t sleep at all, according to Ashkenazim, one should listen to Elokei Nishama and HaMaavir Shenah from someone who did sleep. However, the rest of the Birchot HaShachar one can make oneself. However, according to Sephardim, one may recite these brachot oneself. ↑ In Gemara Pesachim 6a, Rabbanan hold that one should begin to learn Hilchot Pesach thirty days in advance of Pesach, whereas Rabban Shimon Ben Gamliel holds only 2 weeks. Rabbanan learn this idea from Moshe who taught the laws of Pesach Sheni thirty days in advance which was Pesach in Nissan. Shulchan Aruch 429:1 rules like the opinion of the Rabbanan. 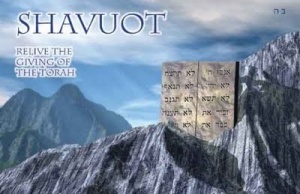 Mishna Brurah 429:1 quotes some who extend this to other Yamim Tovim such as Shavuot, whereas the Gra held that it does not apply to Shavuot and it is sufficient to begin learning the halachot of shavuot from Rosh Chodesh Sivan. ↑ Gemara Megillah 32b states that one should learn the halachot of Shavuot on Shavuot. Mishna Brurah 429:1 quotes this as halacha. ↑ Chazon Ovadyah (Pesach pg 1) explains that the halacha in Gemara Pesachim 6a is relevant in regards to the laws established in Tosefta Sanhedrin 7:5 which state that a person should ask relevant questions and a relevant question has precedence over the irrelevant questions. ↑ Rama O"C 494:3 (quoting Maharil pg. 160) explains that the custom commemorates the joy of Matan Torah. Birkei Yosef 494:6 says that this custom is an ancient one dating back to the time of the Midrash Targum Sheini on Megillat Esther 3:8 which writes that Haman mentioned this minhag of ours to Achashverosh. Magen Avraham 494:5 explains that trees are used for decoration so that we should pray for a good fruit harvest because Shavuot is the day we are judged regarding the fruits of the year. The Levush 494:1 writes that this minhag is based on the pasuk “גַּם-הַצֹּאן וְהַבָּקָר אַל-יִרְעוּ, אֶל-מוּל הָהָר הַהוּא” (Shemot 34:3) which implies that there was pasture on Har Sinai. Sefer Minhag Avoteinu Biyadenu vol. 2 pg. 578 suggests the Maharil himself felt that the minhag was a fulfillment of added simcha of the holiday itself, not a commemoration of the simcha of Matan Torah. He writes that this minhag developed specifically on Shavuot because there is an added level of happiness which manifests in physical pleasures, as the Gemara Pesachim 68b writes that though there is a machloket Tannaim if the holidays should be כולו לה’ or חצי לכם and חצי לה’, all opinions agree that there is an aspect of לכם on Shavuot. With this, he explains why the Maharil writes that the greenery should smell nice. Thus, according to the Maharil, it is our joy in essence of the Torah itself and our ability to learn it that we are celebrating by putting out decorations, while according to the Rama the celebration is more focused on the historical fact that Hashem chose us as His nation and gave us His Torah. see also Yechave Daat 4:33. See further in Sefer Minhag Avotenu Biyadenu vol. 2 pg. 573-604 for a lengthy discussion of the development of this minhag and the various reasons. ↑ This is the opinion of the Gra as quoted by the Chayei Adam 131:13 and Maaseh Rav Siman 195. He felt that since it was only a minhag and not a real din, we should abolish it since it became a religious practice of the non-Jews. This seems to be accepted by the Aruch Hashulchan 494:6 and Rav Moshe Feinstein (Iggerot Moshe YD 4:11:5). The Munkatcher Rov (Shaar Yissachar vol. 2 pg. 119) writes that although the minhag is well-founded, the best option is to refrain. Rav Shlomo Zalman Auerbach (quoted in Ve’alehu Lo Yibol 1:page 184) argues that the Gra only wanted to abolish the custom of placing trees in shuls and not flowers. The Steipler (Orchos Rabbenu vol. 2 pg. 99) agrees. ↑ Chacham Ovadia Yosef (Yechave Daat 4:33 and Yabia Omer YD 3:24, see also Yalkut Yosef Kitzur S”A 494:17) explains that the custom is justified based on the Sh"t Maharik Shoresh 88 who explains that there is no concern of "'Bechukoteihem lo telechu" (Vayikra 18:3, the prohibition regarding following non-Jewish practices and laws) by a custom that has a good reason for its practice. See also Rav Yosef Shaul Nathanson (Yosef Daat Siman 348) and Maharsham (Daat Torah 494:3 and Shu"t Maharsham 1:127), ad Chut Hamishulash pg. 128 who argue in favor of the minhag. Minhagei Edot Yisrael writes that Persian Jews call Shavuot Moed’eh Gol, meaning holiday of flowers. In conclusion, Piskei Teshuvot 494:10 writes that the minhag in most places is to place flowers in the shuls. ↑ Minhag Avoteinu Biyadeinu 2, page 602. ↑ Magen Avraham 494:5, Shulchan Aruch Harav 494:14, Mishna Berura 494:9 write that even though there is not a problem of muktzeh since they were designated from before Shabbat for this purpose, there is still a problem of preparing on Shabbat for Yom Tov. ↑ The Rama 490:9 writes that the minhag is to read Megillas Rut on Shavuot. The Birkei Yosef 694:11 quotes the midrash which says that the reason we read Rut on Shavuot is because it emphasizes the sacrifice Rut made to accept the Torah and because it describes an awesome act of kindness, which is one of the core themes of Torah. See Rabbi Aryeh Lebowitz for Ten Reasons to Read Rus on Shavuos. ↑ Rama 494:3 writes that the minhag is to eat dairy foods on Shavuot. He explains that by having a dairy meal, one ensures that will have two loaves of bread, one for the dairy meal and one for the meat meal, and the two loaves of bread are in commemoration of the Shtei HaLechem brought in the Beit HaMikdash on Shavuot. The Mishna Brurah 494:12 adds an alternative reason for the custom: the Jews had only dairy food immediately after Matan Torah because preparing kosher meat takes a long time. Thus, we eat dairy in commemoration of Matan Torah. Additionally, the Olelot Efraim (Ma’amar 141) writes that the reason for the minhag is that Chazal (Eiruvin 52b) compare learning Torah to a baby suckling milk: just as a baby always finds a new and sweet taste in the milk, so too the learner always a new and sweet taste in Torah. Rav Moshe Shternbuch in Moadim U'zmanim 8:319 says that prior to matan torah, milk was a problem because it could have been considered "ever min hachai," eating from a live animal. Therefore, we celebrate our first opportunity to eat dairy products which occurred at Matan Torah because if the torah in shemot 3:8 praises Israel for being a land filled with milk and honey it has to be that it is permissible for consumption. Additionally, Rav Shternbuch in Teshuvot Vehanhagos 5:161 suggests that we specifically eat cheese on the day of matan Torah since, unlike other foods that spoil with time, aged cheese is actually better than new cheese. As such, we eat cheese on Shavuot to remind us that the 3000 years since Matan Torah doesn't mean the Torah is "outdated," but that it is even greater and just as applicable to our lives. The Yeshuot Yaakov 494:2 gives another reason. He says that the primary change at kabbalat hatorah was that even though the avot could keep mitzvot they didn't have a yetzer hara. We received the yetzer hara at Har Sinai and that's why the gemara tells us that the reward for someone who is commanded in a mitzva is greater than someone's who isn't because he doesn't have a yetzer hara not to fulfill it. Our goal now is to control the yetzer hara and defeat it to achieve the ultimate good. Based on a gemara in Nidda he says that blood is the symbol of tumah so we take the potential for impurity and turn it around completely to achieve the purity of milk. The Bais Halevi on Parashat Yitro gives his own reason. The gemara says that we were given the torah and not the angels because many mitzvot require performance with the body and angels don't have bodies. We have milk and then we have meat to fulfill simchat yom tov, so we show how our observance of the laws of milk and meat requires physicality. The Torat Chaim on Bava Metzia 86b says that we eat dairy based on an Aggada that when Hashem gave us the torah and the angels complained that they should be the ones receiving the torah, Hashem showed them Avraham, and we are told in Bereishit 18:8 that they ate milk and meat together but the Jews don't eat milk and meat together. see also Yalkut Yosef Moadim page 444 and Noda Biyehuda YD 64. ↑ The Rambam (Yom Tov 6:18) rules that the Mitzvah of Simchat Yom Tov is fulfilled through consumption of meat and wine. The Beit Yosef 529:2 asks why the Rambam codifies the consumption of meat on Yom Tov when the Gemara (Pesachim 109a) states clearly that the mitzvah of Simcha is fulfilled through eating meat only during the time of the Beit HaMikdash, while nowadays the mitzvah is fulfilled through wine alone. Accordingly, the S”A 529:1 writes that one must have wine at each Yom Tov meal and makes no mention of the consumption of meat. The Eliyah Rabba 529:6 and Bei’ur Halacha 529 s.v. Keitzad explain that Shulchan Aruch intentionally omitted the obligation to eat meat because of his question in the Beit Yosef. The Yam Shel Shlomo (Beitzah 2:5) answers the Beit Yosef’s question by reinterpreting the Gemara to mean that nowadays, one must have wine in addition to meat, as opposed to the times of the Beit HaMikdash when one could fulfill the Mitzvah through meat without wine. Thus, Mor U’Ketziah 529, Kitzur S”A 103:7, Aruch HaShulchan 529:5, and Chazon Ovadia (Yom Tov, p. 319) rule that it is an obligation to eat meat on Yom Tov. The Bach 529, however, explains that although there is no obligation to eat meat nowadays, there still is a mitzvah to do so, and one would fulfill the Mitzvah of Simcha thereby. The Magen Avraham 529:3, Shulchan Aruch HaRav 529:7, Mishna Brurah 529:11, and Kaf HaChaim 529:28 agree. See also the Sha’agat Aryeh (Siman 65), who argues that Simchat Yom Tov does not obligate one to eat meat in particular; rather, it is fulfilled by what is subjectively considered enjoyable by each person (see Pesachim 109a). Birkei Yosef 529:4 agrees. Darkei Teshuva 89:19 quotes Rav Chaim of Sanz as disagreeing with the Sha’agat Aryeh. (A) Some people eat only dairy on Shavuot in order to fulfill the minhag. The Darkei Teshuva disapproves of this practice because he accepts the view of the Rambam that there is an obligation to eat meat on Yom Tov. See note 1 above. (B) Some people eat dairy for the nighttime meal and meat for the daytime meal. Such was the minhag of the Steipler (Orchot Rabbeinu v. 2 p. 98). The Darkei Teshuva comments that this is reasonable according to the Sha’agat Aryeh’s (Siman 68) view that Simchat Yom Tov is only d’rabanan at night; however, others disagree with the Sha’agat Aryeh. Otzrot Yosef (Rav Dovid Yosef 13:7) quotes this as a minhag. Rav Hershel Schachter (Bikvei HaTzon p. 81) suggests that Simchat Yom Tov follows the schedule of Korbanot for which the night follows the day, implying that eating meat for Simchat Yom Tov does not apply the first night. Therefore, he said (oral communication) that if one enjoys dairy, one may have a dairy meal for the night of Yom Tov. This approach is supported by the Sfat Emet (Sukkah 48a), who writes that Simchat Yom Tov can be fulfilled with one meat meal, either during the night or day. Rabbi Mordechai Willig (Pesachim Shiur 110, min 40-50) agrees with this reasoning. Tangentially, Rav Ovadia Yosef in Meor Yisrael (Beitzah 36b v. 2 p. 313) writes that Shulchan Aruch 546:3 might also hold that simcha at night is only derabbanan. Pitchei Teshuva YD 341:13 quotes the VShav Hakohen 95 who argues that there is a mitzvah of simcha deoritta even at night. He proves his contention from Rambam (Chagiga 2:13) unlike the Maharik ad loc. Rashbam (Pesachim 108b s.v. yedey yayin yatzah (2)) implies that he agrees with Rambam. (C) Some eat a dairy meal and then a meat meal. The Torat Chaim (Chullin 83a) writes that it is better to abrogate the minhag of eating dairy rather than have meat after eating dairy, which is forbidden according to the Zohar. The Darkei Teshuva responds that in order to fulfill this minhag, one may be lenient against the Zohar. Mishna Brurah 494:16 notes that one need not make Birkat HaMazon as long as he cleanses his mouth with bread and water as well as washes his hands (S”A Y.D. 89:2). (D) Some eat a dairy Kiddush, wait an hour, and then have a meat meal. The Darkei Teshuva finds this to be the most preferable minhag. ↑ Magen Avraham (Intro to 494). Chacham Ovadia Yosef in Sh"t Yechave Daat 6:30, Halichot Olam 2: page 3, Chazon Ovadia Yom Tov p. 305, Sh"t Chazon Ovadia 1:1 and Sh"t Yabia Omer 5:6:5 says that ideally one should wait until 20 minutes after sunset but if necessary one can be lenient and say Kiddush earlier, but still should ideally wait until after sunset and try to eat a kezayit of bread after tzet hakochavim. Rav Yakov Pollack (cited by Emek Bracha 69c, Yachava Daat 6:30) is quoted as explaining that one shouldn't make kiddush of Shavuot early since we want the temimot of the sefirat haomer to extend to the very end of the 49th day and not end it early. This is cited by Magen Avraham 494:1 and Taz 494:1. Netsiv (Meishv Dvar OC 18 cited by Yachava Daat) explains that one shouldn't say kiddush of Shavuot early since regarding Shavuot it says וקראתם בעצם היום הזה (Vayikra 23:21). Hitorerut Teshuva 3:68:4 writes that one could accept Yom Tov of Shavuot early and it doesn’t impact temimot. He explains the reason not to daven early is because either way we’re going to be up all night so we might as well say kriyat shema at the right time which is after tzet hakochavim. ↑ Mishna Brurah 494:1 writes based on the Magen Avraham that the practice is to stay up all night to learn. He quotes Arizal who said that one who learns all night on Shavuot will long the next year without being damaged. He also quotes the Magen Avraham who explains that since Bnei Yisrael overslept on the day of Matan Torah we stay up all night in order to rectify that mistake. ↑ Yalkut Yosef Moadim page 439, Sh"t Yechave Daat 3:32. ↑ Magen Avraham (Intro to 494) quotes the Zohar that says that the early Chasidim would learn all of Shavuot night. Birkei Yosef 494:8, Mishna Brurah 494:1, Kaf HaChaim 494:6, Yalkut Yosef Moadim page 438, and Aruch HaShulchan 494:3 also record this minhag. ↑ Regarding Netilat Yadayim and Birkot HaTorah, it’s clear that if they are to be made, they shouldn’t be said until Alot HaShachar. Nitei Gavriel 18:1 and 20:1 writes so explicitly. Regarding Birchot HaShachar, Kaf HaChaim 46:49 writes that one can say all of them at Chatzot, however, Piskei Teshuvot 46:14 rules that one should wait until Alot HaShachar. Regarding Tallit, S”A 18:3 rules that one may not make the Bracha until MeSheYakir. The Rosh (Brachot 9:23) writes that the reason a person must wash his hands in the morning is that one's hands almost certainly touched an unclean area. The Rashba (responsa 1:191), on the other hand, writes that the reason is that a person is created anew each morning. The Bet Yosef 4:13 writes that according to the Rosh, one who stays up all night doesn't have to wash because one can ensure that his hands stay clean, while according to the Rashba, one is created anew whether he slept or not. Because of this dispute, S”A and Rama 4:13 rule that one should wash without a bracha. Magen Avraham 494, Taz 4:9, Beiur HaGra 4:13, Birkei Yosef 46:12, and Mishna Brurah 494:1 agree. See, the Bach 4, Aruch HaShulchan 4:12, and Maaseh Rav (#2) who argue that one who didn’t sleep can say the Bracha. Hagahot Rabbi Akiva Eiger 4:12 writes that if one went to the bathroom, one can make the bracha. Olat Tamid 4:8, Eliyah Rabba 4:8, and Pri Megadim (E”A 494) agree. Artzot HaChaim 4:1:14 and Chaye Adam 7:6 seem to agree as well. Thus, Mishna Brurah 4:30 rules one should use the bathroom, thus dirtying his hands, wash his hands with a Bracha, and then say Asher Yatzar. Some achronim (Nitei Gavriel 18:1, Weekly Halacha Discussion, vol 2, p. 363, Halachically Speaking vol 7, issue 6, p. 9) quote the Mishna Brurah as saying that one should use the bathroom and leave out dirtying one’s hands. Rabbi Mordechai Willig and Rabbi Hershel Schachter (cited by Halachipedia Article #22) explained that although the Mishna Brurah certainly meant to be precise, one can make the Bracha even if one merely touches an unclean area of the body. Derech HaChaim 1:17 adds that even by touching an unclean area, one can make the Bracha. Beiur Halacha s.v. Veyitlem agrees. Rav Shlomo Zalman Auerbach (Halichot Shlomo 2:24), however, argues that it is insufficient to touch an unclean area. Maamar Mordechai 4:8 disagrees with Rabbi Akiva Eiger because even according to the Rashba there is a doubt as to whether one is considered created anew if he didn’t sleep (see Magen Avraham 4:12). Kaf HaChaim 4:49 and Yalkut Yosef 4:9 agree. The Tur and S”A 47:12 write that if one is learning at night one doesn't have to make new Birkot HaTorah as long as one didn't fall asleep. Beiur HaGra 47:12 explains that sleep is a hefsek and if one didn't sleep, one doesn't need new Brachot. Chaye Adam 9:9, Mishna Brurah 47:28, and Rabbi Hershel Schachter (cited in Bet Yitzchak vol 30, p. 592) agree but advise hearing them from someone who slept. Magen Avraham (47:12, 494) argues that essentially Birkot HaTorah are like Birkot HaShachar, which are said every day. He adds that it's preferable to hear them from someone who certainly is obligated. Eliyah Rabba 47:9, Birkei Yosef 46:12, and Aruch HaShulchan 47:23 concur. Kaf HaChaim 47:26 and Chazon Ovadyah (p. 312) write that the Sephardic minhag is to make Birkot HaTorah oneself. Rama 46:8 writes that one may say all the Birkot HaShachar whether one experienced the event described in the particular Bracha or not. Although the Shulchan Aruch argues, Kaf HaChaim 46:49 writes that the Sephardic minhag is to follow the Rama. Eliyah Rabba 46:12 quotes the Ateret Zekenim 46:3 who says that if one didn't sleep, one shouldn't say Elokai Nishama or HaMaavir Sheinah. Thus, Mishna Brurah 46:24 writes that one should hear these Brachot from someone who slept. However, Pri Megadim (E”A 46:2) wonders why Elokai Nishama and HaMaarvir Sheinah should be different than the other Birkot HaShachar. Aruch HaShulchan 46:13 rules that one may say these brachot even if he didn't sleep. Also, Birkei Yosef 46:12 and Yalkut Yosef 489:13 Moadim page 441 write that the Sephardic minhag is to say these Brachot even if one didn’t sleep. ↑ Although S”A 8:16 rules if one slept in one’s Tzitzit one should make a Bracha upon arising, the Bach 8:15, Taz 8:15, Eliyah Rabba 8:18, and Kaf HaChaim 8:61 argue that one shouldn’t make a Bracha. Magen Avraham 8:21 writes that one should have in mind that his bracha on the Tallit should exempt his Tallit Katan. Mishna Brurah 8:42 agrees. Rabbi Hershel Schachter (cited in Bet Yitzchak vol 30, p. 591) rules that if one doesn't have a Tallit, onee should hear the Bracha from someone else and feel his Tzitzit at the time of the Bracha. ↑ Hagahot Rabbi Akiva Eiger 47:12 writes that if one slept during the day prior to staying up all night, according to all opinions one has to recite Birkot HaTorah in the morning. Mishna Brurah 47:28 specifies that the sleep should be a Sheinat Kevah. Chatam Sofer (cited by Netah Sorek YD 63), Hilchot Chag BeChag (p. 131), and Rabbi Mordechai Willig (“Inyanei Chag Hashavuos”, min 48) agree. See Beirur Halacha (vol 7, p. 20) who quotes the Chazon Ish as questioning Rabbi Akiva Eiger. ↑ Mishna Brurah 4:30, 494:1. The Artzot Hachaim (Eretz Yehuda 4:14) writes that a person who went to the bathroom can recite a bracha on netilat yadayim. According to the Rashba a bracha is automatically required since maybe a person is recreated each day even if he didn't sleep. According to the Rosh a bracha is required since a person's are dirty and require netilat yadayim after going to the bathroom. His conclusion is that it is necessary either go number two or number one and to wipe off the urine drops from oneself. This definition of what requires Netilat Yadayim for dirty hands is discussed in Bet Yosef 7. Ishei Yisrael (ch. 2 n. 99) cites the Shulchan Aruch Harav who holds that it is sufficient to touch the areas that are uncovered. However, he quotes Rav Shlomo Zalman Auerbach who disagrees and holds that touching an uncovered area doesn't require a bracha. ↑ S”A 4:14 says that if one was awake from before Olot HaShachar and washed his hands earlier, he should wash again at Olot HaShachar without a Bracha because of Safek. Piskei Teshuvot 494:5 says once there’s an obligation to wash one’s hands one shouldn’t learn Torah. ↑ Yalkut Yosef Moadim 441. ↑ S”A 8:16 rules that if one slept in Tzitzit one may make a new Bracha on it in the morning and at the time of the Bracha one should shake the Tzitzit strings. Mishna Brurah 8:42 explains that really this issue depends on whether there’s a mitzvah of Tzitzit at night and so it’s preferable to make the Bracha on a Tallit and cover the Bracha for Tzitzit. Piskei Teshuvot 8:30 adds that someone who that option is unavailable, such as bochrim who don’t wear Tallitim, should make the Bracha oneself like S”A. ↑ Yabia Omer O.C. 5:6, Yechave Daat 3:33. ↑ Yalkut Yosef Chelek 1 page 137. ↑ Yalkut Yosef Moadim page 445, Chazon Ovadia Yom Tov page 329. This page was last edited on 14 February 2019, at 18:35.